Sorry, this competition has now closed! 1. Eligibility: This promotion is only open to residents of the United Kingdom (England, Scotland, Wales and Northern Ireland), aged over 18, excluding employees of spoiltpig, Denhay Farms Ltd (the “Promoter”) and all those professionally associated with this promotion. 2. No purchase required but internet access is required. 3. Promotion Period: The promotion will run from 00:01 on 24th August 2015 until 23:59 on 26th October 2015. Within this period, there will be 10 weekly draws, each closing at 23.59 every Monday. 4. To Enter: go to www.facebook.com/spoiltpig and click on the “You’ve Earnt It” tab. 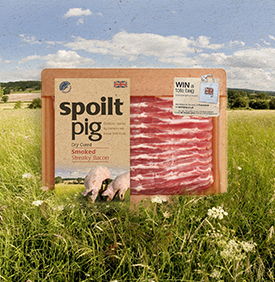 Or you can enter via www.spoiltpig.co.uk and click on “Things to do and win” and then “Competitions”. Enter your name, address, date of birth, email address and phone number (optional) and press “SUBMIT” to be entered into the next available prize draw. 5. Only one entry per person per week is permitted. 6. A maximum of one prize may be won per person during the promotional period. 7. The Prizes: Each week, for 10 weeks, 60 winners will be drawn to win one of 60 x spoiltpig jute bags. 600 bags to be won in total. 8. The Reward: Every person entering for the prize draw will also be sent 1 x 75p off next spoiltpig purchase voucher (as long as address details are supplied). 9. Winner Selection: Within 3 working days of each weekly draw closing date during the Promotional Period there will be a random draw from all valid entries received. Winners will be picked by a computer process that produces verifiably random results. 10. Winner Notification: Winners will be notified within 7 days of the relevant draw by email and will be asked to respond confirming their address within 28 days of initial notification. Failure to do so will result in an alternative winner being selected from all valid entrants. 11. Prizes will be despatched within 28 days of winner address confirmation. 12. All entries must be made by the participant themselves. Bulk entries made from trade, consumer groups or third parties will not be accepted. Incomplete or illegible entries and entries which do not satisfy the requirements of these terms and conditions in full will be disqualified and will not be counted. If it becomes apparent that an entrant is using a computer(s) to circumvent this condition by, for example, the use of ‘script’, ‘brute force’, masking their identity by manipulating IP addresses, using identities other than their own or any other automated means in order to increase that participant’s entries into the draw in a way that is not consistent with the spirit of the promotion, that participant’s entries will be disqualified and any prize award will be void. 13. No responsibility is accepted for entries lost, damaged or delayed or as a result of any network, computer hardware or software failure of any kind. Proof of sending will not be accepted as proof of receipt. The Promoter and any affiliated companies are not responsible for any entry, generated by computer hardware or software, malfunction, error or failure. 14. The name of the winner may be used for promotional purposes by the Promoter, unless winners otherwise notify the Promoter at the time of accepting their prize. 15. Winners’ full names and counties will be available by emailing [email protected] to spoiltpig, Denhay Farms Ltd, Devonshire Road, Heathpark, Honiton, Devon EX14 1SD for a period of one month following the closing date. 16. This promotion is in no way sponsored, endorsed or administered by, or associated with, Facebook. You understand that you are providing information to the Promoter and not to Facebook. The information you provide will only be used for fulfilment of this promotion unless you have agreed to its use for any other purpose. By entering the promotion all participants agree to a complete liability release for Facebook. 17. Winners may be requested to participate in publicity arising from the promotion but are not obliged to participate in publicity. 18. Aside from the use of entry data for the administration performance of this promotion, the Promoter will not use personal data for any other purpose without the express consent of the entrant. 19. The Promoter cannot accept any responsibility for any damage, loss, injury suffered by any entrant entering the promotion or as a result of accepting or participating in any prize. Nothing shall exclude the Promoter’s liability for death or personal injury as a result of its negligence. 20. If for any reason the promotion is not capable of running as planned for reasons (including but not limited to tampering, unauthorised intervention, fraud, technical failures or any other causes beyond the control of the Promoter which corrupt or affect the administration, security, fairness, integrity or proper conduct of this promotion), the Promoter reserves the right (subject to any written directions given under applicable law) to disqualify any individual who tampers with the entry process and to cancel, terminate, modify or suspend the promotion. 21. If an act, omission, event or circumstance occurs which is beyond the reasonable control of the Promoter and which prevents the Promoter from complying with these terms and conditions the Promoter will not be liable for any failure to perform or delay in performing its obligation. 22. By entering this promotion, all participants will be deemed to have accepted and be bound by the terms and conditions. 23. This promotion is governed by the English Law and participants submit to the exclusive jurisdiction of the English courts.